Building a pergola is one of the easiest woodworking/DIY tasks out there—so if you're keen to test your skills, this is a good place to start! Remember those plastic garden chairs that fade from heat the sun or those massive rattan furniture you used to have in your home? I'm sure these things bring back some wonderful memories. For some reason, a lot of people neglect or fail to really utilize or maintain their garden space. So today, how about we give that green space a bit more love - the same way we do for the rest of the house. 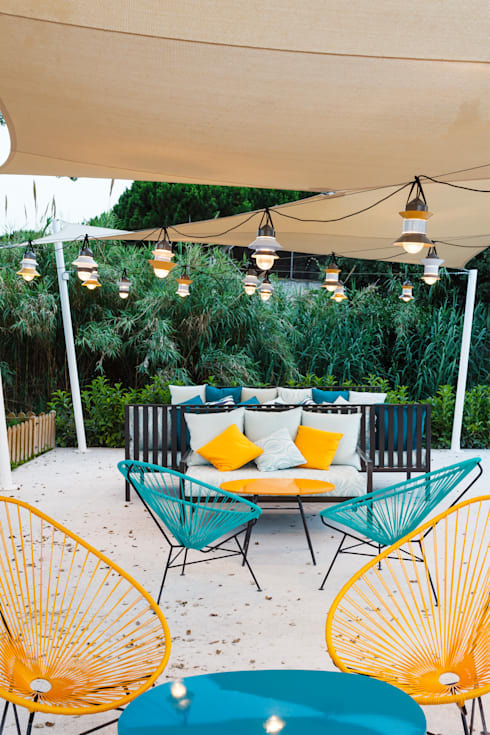 It won't be much of a surprise finding yourself spending the summer afternoons relaxing with the book or entertaining friends in your very own garden. Why not make it a comfortable space where you could have grill parties, morning coffee or Sunday lunches. In this case, it is necessary to have roofing, a set of comfortable furniture, flooring, and ample lighting. All these features will soon get you falling in love with a cozy garden gazebo. Wooden, stone or pergola? Choosing the market is so big that everyone will find something perfect for themselves. 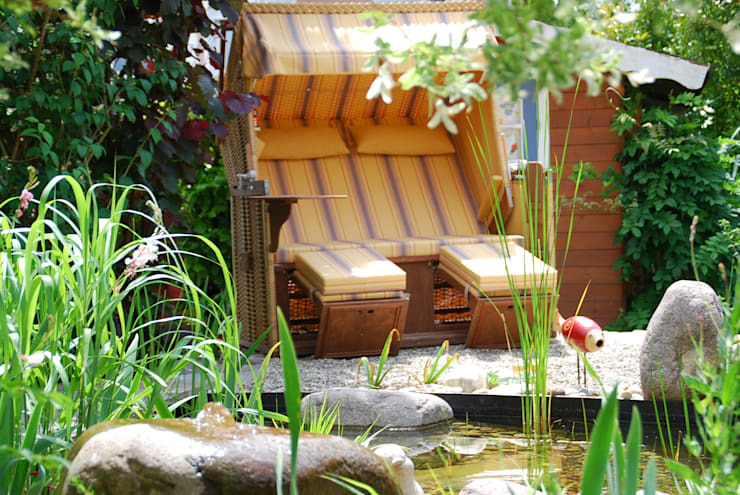 We have searched for you 10 of the most interesting garden arbours. 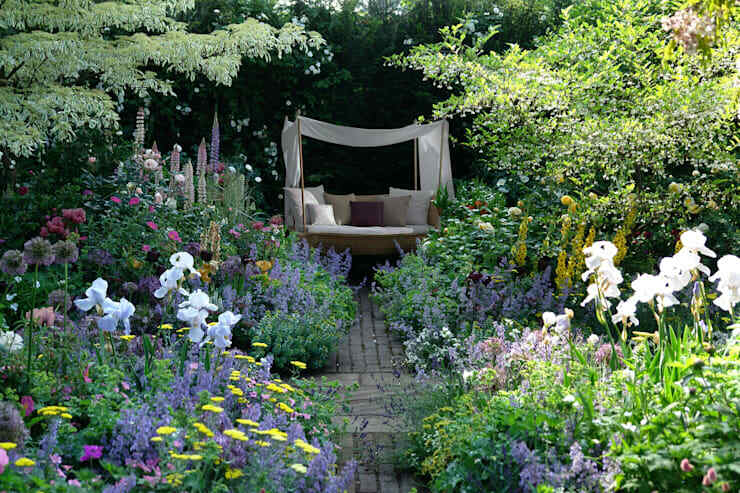 The wooden gazebo in this photo, with it's openness, allows you to be more in tune with the garden. The side walls and roof provides a bit more protection against adverse weather. 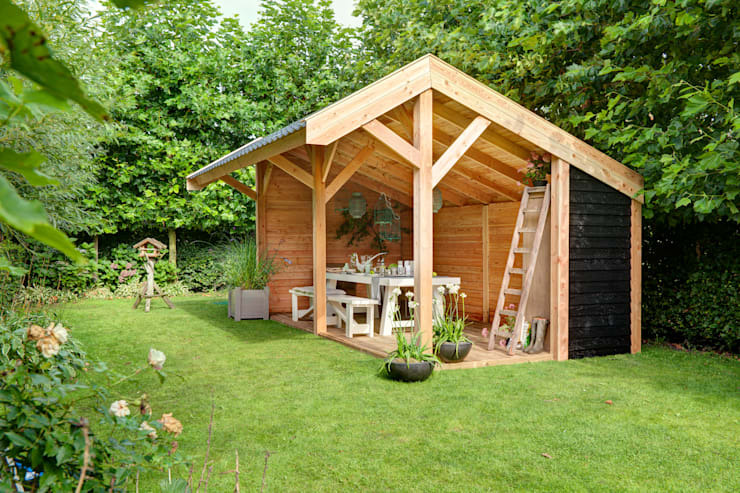 Behind the gazebo is a shed where you can store your garden tools. Such a compartment is very practical and convenient—you won't have to carry hoes, shovels, gloves, watering cans or working clothes at all times after finishing work on the plants. It would also be worth the extra effort to add in some electrical connections in this area so you could have good lighting and power for your lawn mower. This garden nook is the epitome of coziness. 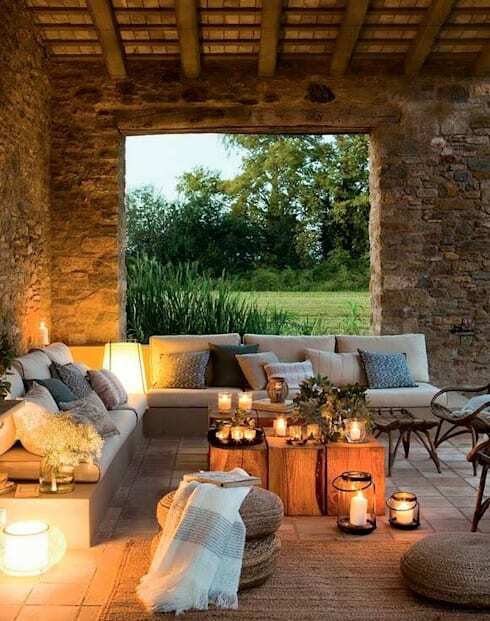 Rustic stone walls make the space extremely warm and charming. Everything is preserved in a very traditional style and the huge opening makes us feel that we are still in the bosom of nature. Stones, simple furniture, and a few accessories make for a perfect mood. You will definitely want to spend time in a place like this! Here is a more courageous and modern version of the gazebo. Sails suspended on the pylons perfectly cover the seating area against the hot sun on hot days. With this kind of arrangement you'll feel revitalized as you draw in positive energy. The bright turquoise in combination with yellow is a very energetic and modern combination. Everything is underlined by green vegetation, which further highlights these two colors. Then there's the cultured Acapulco chairs which provide comfortable seating and relaxation. This quirky setting will certainly will appeal to the young. This poolside pergola provides an inviting space that is comfortable and relaxing. The furniture is perfect for lounging and the white curtains give off that beach atmosphere. Such lightweight gazebos are also quite easy to construction. Be mindful to also consider having a concrete foundation about 80 cm into the ground. 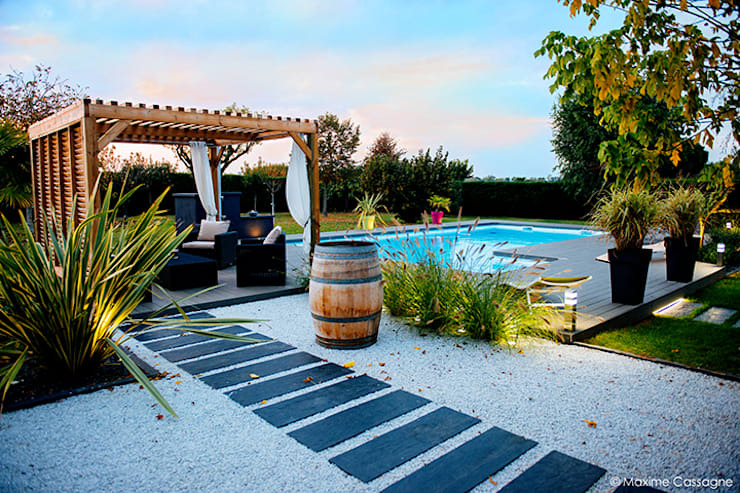 In the photo the pergola stands on a wooden floor—the same wood used along the pool, creating a coherent and aesthetic backyard space. Let's stay and rest for a while in this Mediterranean inspired seating area. The style makes you feel like you are in the ruins or a remodeled version of a broken down cottage. The construction made of natural stone is excellent protection against wind and rain. The charming red tile emphasizes the traditional character of the gazebo. 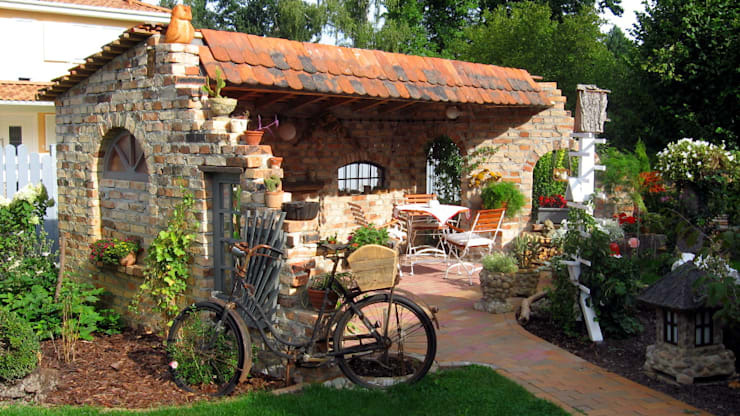 Terracotta pots with lush vegetation, an old bicycle sitting along an old gate, and delicate furniture. Here, you can definitely rest for hours. 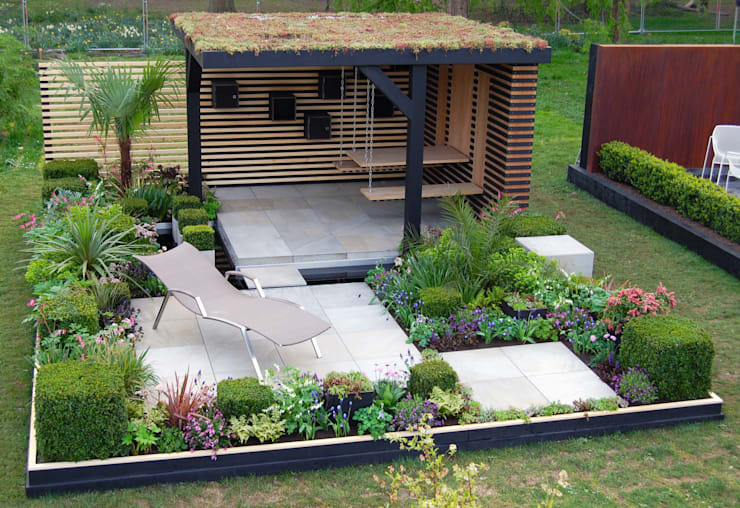 This modern garden, combined with the simple form and structure of the gazebo is a bull's eye! The pavilion is extremely modern in appearance with the use of suspended furniture-swings. The combination of black, brown and gray colors with a gray floor gives it a timeless look. The grass on the roof is not only beautiful but it also helps cool down the space during those sunny summer days. The entire complex feels like a complete garden arrangement that can be inserted just about anywhere. 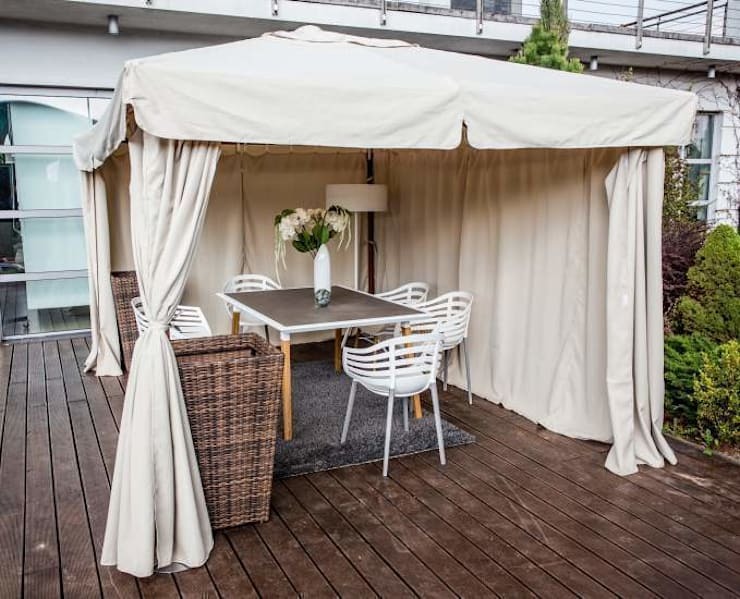 OGRODOWY SALON offers you a pavilion, which is a lightweight structure meeting the same criteria as the gazebo, but it can be easily folded and stored during the winter. This construction can also be moved to another location without much hassle. The waterproof material could also be easily be drawn open or closed according to your preference. The elegant accessories also make the place stylish and refined. The garden, gazebo and furniture are Asian inspired. There is so much space for relaxation thanks to a dedicated team of indoor and open space specialists. The whole space is stylish and elegant with the dark wood against light textiles - a pure recipe for beauty. The enormous amount of seating allows you to accommodate and entertain some friends and relatives. Not everyone wants that much space, if so then you can opt to have a small house surrounded by a larger garden—that's entirely up to you. These tiny pocket areas could have a siting area perfect for taking a nap or having a foot massage housed in this Baltic styled mini-gazebo. Here's another idea for small spaces. With this enticing canopy you could create that oriental atmosphere into every garden. Due to its lightness and simple construction it can be moved to any place without much effort. This gazebo-like daybed is the perfect lounge for resting—listen to your favorite songs or open a book and just enjoy that well-deserved rest.